I sometimes simplify when it makes sense in the musical context of the work at hand. Corrette, on the other hand, has bassists simplifying all the time. I think that’s because he knew that the people available wouldn’t be able to handle the bass parts adequately, so he wanted what he thought was the next best thing, a simplified bass part that at least allowed for some of the lowest notes to be heard. My real issue, though, is that I’ve experienced some bass players who take this simplification stuff way too seriously and want to play everything in this manner. Needless to say, to me that’s just bonkers – if you can’t stand the heat, stay out of the kitchen. 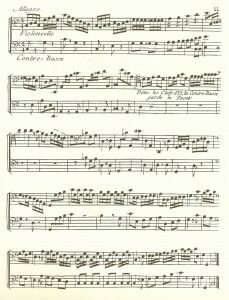 If you look at different bass parts in Rameau, Marais, Montéclair or other French composers, you can easily see that Corrette’s systematic oversimplification makes no sense. It takes away much more than it supposedly adds. I completely understand the historical context of how and why Corrette published his bass method – bass players were needed, none were there, so he tried to produce some – but as far as trying to make his oversimplifying an established way of playing baroque, late baroque, or early classical music, it makes no sense. Oversimplfying is only a crutch that helps you move forward, but it doesn’t teach you how to move on your own. Hause wrote the first edition of his method 20 to 30 years after Corrette. Hause was a bass player, he knew what he was doing, and he never mentions simplification – anywhere. Give Corrette credit where it is due, for trying to get musicians to become interested in the bass in the first place, but also realize that his method is by no means a be all and end all.